A Colorado notary may notarize a Spanish document. A document does not need to be in the English language, but the customer must be able to communicate with the notary. The notary certificate attached to the Spanish document does not need to be in English if the notary can read the notary certificate. Otherwise, the notary will need to attach a notary certificate in English. If the customer needs an Apostille (authentication) from the Secretary of State (SOS), the notary certificate must be in English. A jurat certificate is attached to a sworn document. The signer must swear or affirm to the notary that the statements and information in the document are true and correct, and that he/she is signing knowingly and willingly. The notary verifies the identification of the signer, administers an oath or affirmation to the signer, and should not notarize the document if the signer does not appear to be signing knowingly and willingly. The signer must sign the document in front of the notary. A commonly notarized document that uses a jurat is an Affidavit, or declaración jurada or jurada in Spanish. 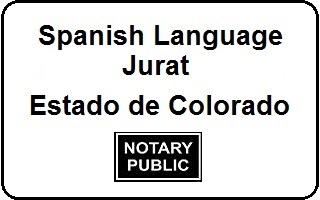 Below is the Colorado notary certificate form for a jurat, in English and in Spanish. Note: a Colorado notary public must not use the words notario or notario publico unless the notary is also an attorney in Colorado. So, in the Spanish document, the English words notary public are used, not notario publico.